The Croatian Football Federation (HNS) and Croatia's World Roma Organization organized their Ninth National Minorities Football Camp at Aldo Drosina Stadium in Pula, Croatia. 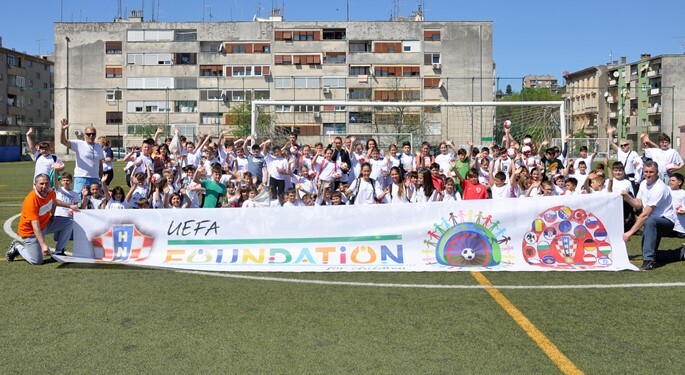 With 250 children of different nationalities in attendance, the football camp – which took place on April 20, 2018 – was the largest one organized by HNS and Croatia's World Roma Organization so far. Along with children from preschools and primary schools in the County of Istria, the football camp was also attended by children from the Pula Center for Education and by a young asylum seeker from Pakistan. "It's not a coincidence that the Ninth National Minorities Football Camp was held in Pula, a city which is well-known for its commitment to tolerance and diversity, and in which we strive to show everyone respect," said Pula Mayor Boris Miletić at the football camp's opening ceremony. Along with Istria Police Chief Alen Klabot, the event was attended by President of Croatia's World Roma Organization Toti Dedić and co-organizer Elmir Mehmedović, as well as by President of the County Football Association of Istria Igor Žiković and Head of the Department for Social Causes Elvira Krizmanić-Marjanović. Šuker: "Differences have to be respected"